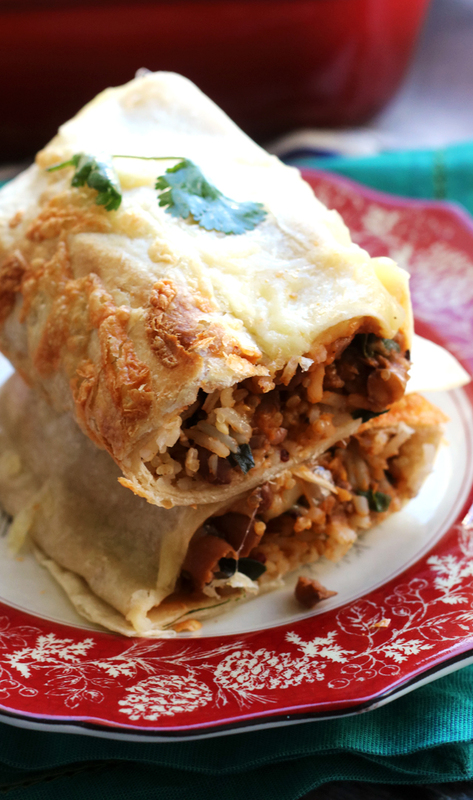 These baked vegetarian burritos are stuffed with a smoky chipotle-seasoned pinto bean and swiss chard filling, lots of cheese, and brown rice. 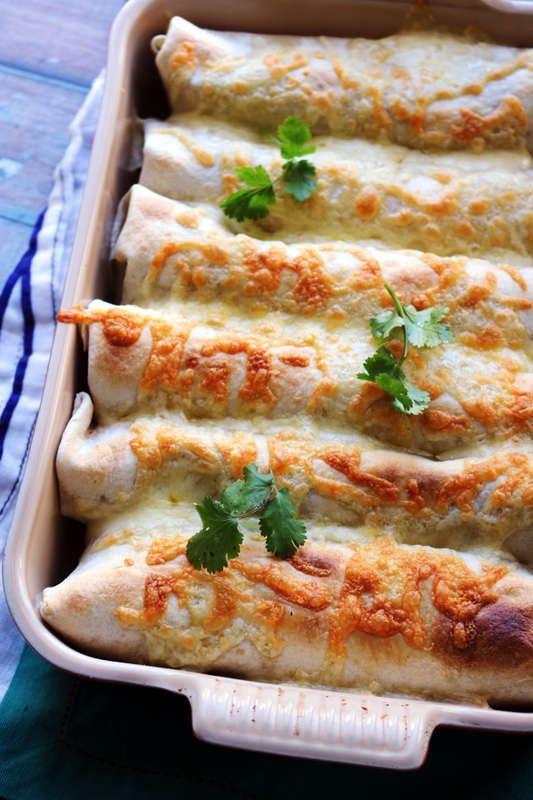 They are then placed under the broiler, topped with even more cheese and baked until crispy! There’s a new Best Ever Vegetarian Burrito in town. And I really do sincerely adore the Chipotle sofritas burrito filling, so I am not saying this lightly, buuuuutttttt smoky pinto beans, swiss chard, and SO MUCH CHEESE are where it’s at. Also, CRISPY CHEESE-TOPPED burrito shells. Such a simple change, but such a game-changer. Even if you’re just totally not into the idea of a vegetarian burrito (least of all, one with GREENS in it! the horror! ), PLEASE try to crispify (<–totally a word) your burritos at least once. So, I’ve been on a Mexican food kick lately and part of it is that Remy is obsessed with avocados (but only in the form of guacamole OR if they’re topped with a balsamic reduction –> she’s so spoiled). But it’s also because I just really love Mexican food. Duh. We went out to brunch at a Mexican restaurant a few weeks ago and I was totally depressed at the vegetarian options. There was only one and they wouldn’t omit the meat in the option I really wanted. Annoying. As a result, I’ve pretty much decided it’s my life mission to make as much Mexican-inspired vegetarian food as humanly possible, and make it taste damn good. These baked burritos are almost 100% from America’s Test Kitchen’s Complete Vegetarian Cookbook (aka my cooking bible). They are smoky, savory, full of good for you ingredients and oozing cheese out of every bite. They’re basically everything I love in a burrito and I can honestly say that now I can cease my endless New York restaurant search for a vegetarian burrito messiah. 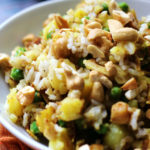 In a small saucepan combine 1¼ cups of the vegetable broth, the rice, half of the garlic, and ½ tsp salt. Bring to a boil. Once boiling, turn heat to low and allow to simmer, covered, until the rice is tender and the broth has evaporated, about 45 minutes. Remove from the heat and allow to sit, covered, for 10 minutes. Fluff with a fork and set aside. Meanwhile, heat the olive oil over medium heat until shimmering. Add the onion to the pan and cook until tender, about 4-5 minutes. Stir in the tomato paste, minced chipotle, cumin, oregano, remaining garlic, and remaining salt. Saute until fragrant, about 1 minute. Add the swiss chard and remaining ½ cup of vegetable broth to the pan. Simmer until chard is wilted and tender, about 15 minutes. Stir in the lime juice and pinto beans and cook until heated through. Season to taste with salt. Heat the broiler on high. Wrap tortillas in a damp (but clean!) dish towel or paper towels and microwave until warm, about 1 minute. Arrange tortillas on work surface. Divide the bean and chard mixture, rice, and 1½ cups of the cheese in the center of the tortillas. Working with one tortilla at a time, fold the side of the tortilla over the filling and then fold up the bottom edge closest to you and roll as tightly as possible around the filling into a burrito. Place seam-side down on a parchment-lined baking sheet. Repeat with remaining burritos. Sprinkle the remaining 1 cup of cheese on top of the burritos. Broil until cheese is melted and starts to brown, about 3-5 minutes. Serve warm. 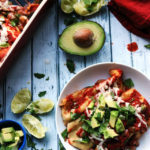 Mexican food is so easy time vegetarianize too! We often have vegetarian tamales, mole is a great veggie topper, and last week we even had black bean and quinoa tacos! Now those are some absolutely delicious burritos!!! Please save me a couple will you? 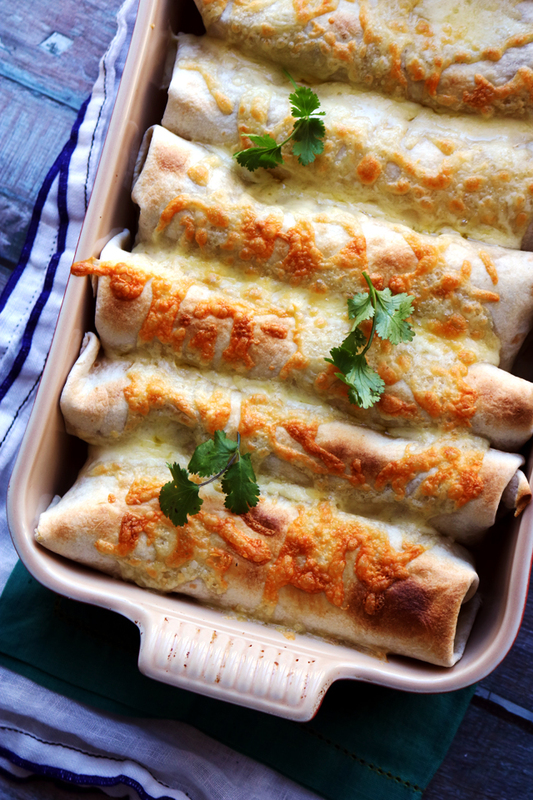 I have a huge craving for Mexican food now… the burritos look AMAZING! Ohhhh my gosh. I thought that crispy cheese topping was hte best ever, but then I saw that filling and yesss. Making these ASAP! These look so mouth-watering! Definitely better than what I’ve seen Chipotle offers!! This was so good! 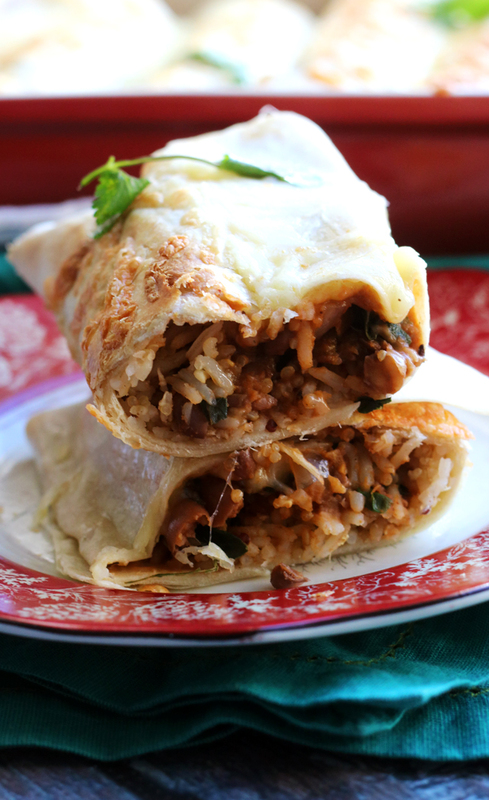 I cooked the rice and veggie-bean filling on Sunday night and assembled and baked the burritos on Monday night. These freeze well and make an easy grab-and-go lunch. 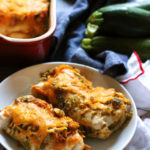 I wonder how these would be with just the chard, the pinto beans, and the cheese? I kind of want some bean burritos, but don’t actually like Mexican food. I would still include the spices because that is what gives the meal flavor! And I think even if you don’t like typical Mexican food, you may like these because they are a bit off the beaten path. I used chicken broth instead of vegetable (I also used more than the recipe just by eyeballing what I needed) and I used basmati brown rice mixed with red quinoa. Other than the tortilla this was really healthy! I actually used fresh tortillas so I don’t feel bad about it. 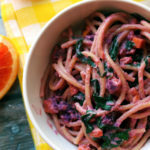 Super filling comfort food without the guilt. I tend to be scared of spice so I only used about 3/4 of a large chile and there was no spice at all – just great flavor. I could have used the whole thing and I will do that next time. This was a really easy and quick recipe and I will definitely make it again soon. Would you mind sharing the brand of tortillas you used for these pictures? They look like they really held their shape. I made some enchiladas 2 weeks ago and the tortillas were gooey (?) I understand they were covered in sauce, but they were much softer than anything I’ve had elsewhere. I believe these were Maria & Ricardos Tortillas, but I’ve been using La Tortilla Factory more recently!